“I took forward to the inquest” said a member of the twitter commentariat reflecting on the volatility in British polling and the wide divergence we saw from different pollsters predicting anything from an 11% Conservative win to a 3% Labour victory on June 8th. YouGov however broke the mould during the campaign earning a reputation as something of a maverick, producing poll after poll consistently showing a close race. With the benefit of hindsight we can now see they were pretty close as the graphic indicates. So how did they do it? YouGov gathered data from 50,000 interviews conducted each week during the campaign. This was supported by additional polling data on previous voting intention, demographic information and likelihood to turnout which they built into a live model of the electorate. It certainly raised eyebrows, showing Labour competing in seats neither they nor the Conservatives seemed to think Corbyn’s party had a chance of taking. YouGov’s numbers were underpinned by a prediction of a rise in the ratio of the youth and student vote suggesting it would be the highest turnout of 18-24 year olds since 1992. These figures have been born out by an early analysis of the voting public, with a turnout of over 66% among 18-24 year olds, up significantly from 43% in 2015 according to analysis by the Independent. Crucially for Labour, they won the support of 63% of this growing youth vote at the ballot box. Other polling aggregators such as electoral calculus used a more traditional uniform swing model enriched with demographic data to provide an average of current polls and show a rough approximation. Their predictions of a Conservative majority in the high 60s apparently exaggerating support for Theresa May’s party on a national scale. Those pollsters relying heavily on phone based surveys seem to have fared the worst in failing to reflect the rise of youth vote and in some cases revising down turnout projections for the 18-24 group. 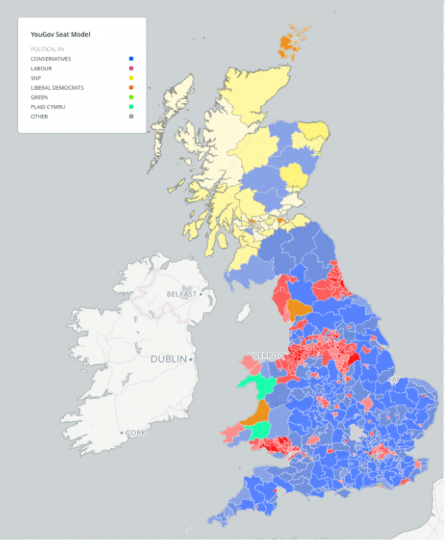 The kind of modelling undertaken by YouGov in place of these traditional polling techniques represents an attempt not just to poll a representative sample but to use that information to create a simulation of electorate. It has picked up momentum in recent years and has become something of a holy grail for British election aficionados looking enviously across the Atlantic to the likes of Nate Silver and FiveThirtyEight’s probability model which came to fame after correctly predicting the 2012 US Presidential Election result. To sound a note of caution, these simulations are only as good as the information submitted to them. Silver’s model failed to predict the US presidential election in 2016 which potentially presents a vulnerability in such simulations when elections are close. There has been a fair amount of healthy scepticism around the polls and simulations this time around due in part to failures to accurately predict the 2015 General Election and Brexit referendum outcomes. This has been reflected in traditional news media which have as a rule invested in far more qualitative on the ground reporting and exit polling than in previous elections. This in itself could mark a huge sea-change for the polling industry which has traditionally relied on the income from print and news media to sustain their business model. While there are certainly moves away from a reliance on polling when reporting and understanding elections, the YouGov study demonstrates that when done well it remains highly relevant and it will be one to watch for the next General Election, whenever that may be. Invicta has brought together the key points from both the Conservative and Labour Party #GE17 manifestos on a range of important issues including the Economy, Public Spending & Tax, Business & Workers Rights, Energy & Industrial Strategy, Housing and Brexit & Constitutional Reform. Click here to download our guide to the Conservative and Labour Party manifestos. 1. A balanced budget by the middle of the next decade. 2. Prioritise a strong economy to help fund public services. 3. Competitive and affordable energy costs. 4. Continuation of the Northern Powerhouse agenda. 1. Set target of eliminating the government’s deficit on day-to-day spending within five years. 2. A National Investment Bank as part of a plan to provide £250bn of lending power over the next decade for infrastructure which will support a network of regional investment banks. 3. Change the law to put a firm ring fence between investment and retail banks. 4. Bring rail companies back into public ownership, reverse the privatisation of Royal Mail. 1. Increase the personal allowance to £12,500 and the higher rate to £50,000 by 2020. 3. 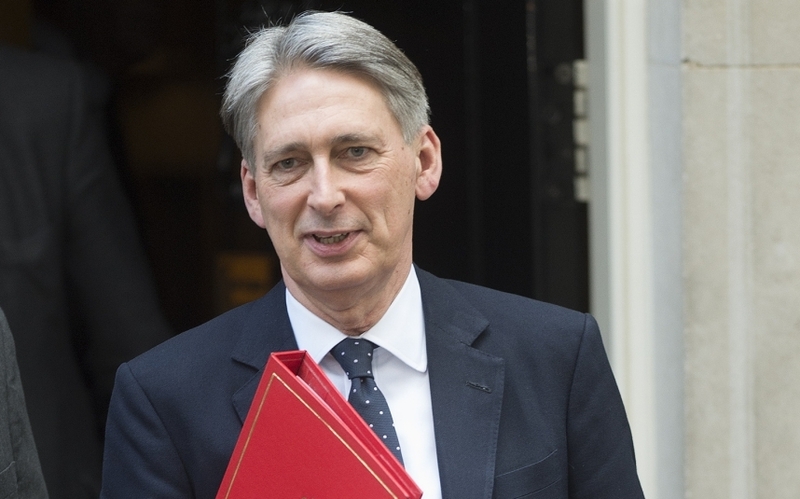 Maintain plans to cut corporation tax to 17%. 1. No rises in income tax for those earning below £80,000 a year on personal National Insurance Contributions and on VAT. 2. A claim the manifesto commitments are “fully costed” with all current spending paid for out of taxation or redirected revenue stream. 3. End the Public Sector Pay cap. 1. Reform the rules on takeovers and mergers to prevent asset stripping. 2. Legislate to make sure corporate pay is subject to strict votes by shareholders. 3. Improve corporate governance to make sure companies take into account more than just shareholders. 4. Protect private pensions by tightening the rules around people who abuse pension funds. 5. Clamp down on tax evasion with new regulations of tax advisory firms. 6. Increase the living wage to 60 percent of median earnings. 1. Reinstate the lower small-business corporation tax rate. 2. Scrap quarterly reporting for businesses with a turnover of under £85,000. 3. Protect small businesses by mandating action against companies who fail to pay invoices on time. 4. Introduce a 20 point plan for security and equality at work including banning zero hours contracts, introduce sectoral collective bargaining, raising the minimum wage to £10 per hour and roll out maximum pay ratios of 20:1 in the public sector. 5. Shifting the burden of proof so that the law assumes a worker is an employee unless the employer can prove otherwise. 1. UK should have the lowest energy costs in Europe, both for households and businesses. 2. Establish an industrial energy efficiency scheme to help large companies install measures to cut their energy use and their bills. 3. Against more large-scale onshore wind power for England, but maintain position as a global leader in offshore wind and development of wind projects in the remote islands of Scotland, where they directly benefit local communities. 5. Change proposed shale wealth fund so greater percentage of tax revenues from shale gas directly benefit the communities that host the extraction sites. 1. Nuclear power “will continue to be part of the UK energy supply”. 2. A ban on fracking. 3. Introduce an immediate emergency energy price cap to ensure the average dual fuel household energy bill remains below £1,000 per year. 4. Maintaining access to the EU’s internal energy market and retaining access to nuclear research programme Euratom will be a priority in Brexit negotiations. 5. Ensure that 60 per cent of the UK’s energy comes from zero-carbon or renewable sources by 2030. 6. Meet the OECD target of 3 percent of GDP spent on research and development by 2030. 1. Halve rough sleeping over the course of the next parliament and eliminate it by 2027. 2. Meet 2015 commitment to deliver a million homes by the end of 2020 and half a million more by the end of 2022. 3. Build better houses to match the quality of previous generations. 4. Support for high-quality, high-density housing like mansion blocks, mews houses and terraced streets 160,000 houses built on government land. 5. Maintain the existing strong protections on designated land like the Green Belt, National Parks and Areas of Outstanding Natural Beauty. 6. Continue £2.5bn flood defence programme to protect 300,000 existing homes by 2021. 1. At least 100,000 council and housing association homes built a year by the end of the next Parliament. 2. “Thousands more low-cost homes” reserved for first-time buyers. 4. An additional 4,000 homes reserved for people with a history of rough sleeping. 1. In favour of an orderly Brexit. 2. Continue with current boundary review proposals. 3. Extend FPTP electoral system to Police and Crime Commissioner and Mayoral Elections. 4. Repeal the Fixed Term Parliament Act. 5. Legislate for people to present ID before they vote. 1. Leaving the EU with no deal is the worst possible option. 2. Pursue continued access to EU Markets. 3. Make sure all EU laws and rights are enshrined in British law. 4. Ensure there is no drop in EU structural funding to regions. 5. Reduce the voting age to 16. 7. Oppose a second Scottish Independence Referendum. 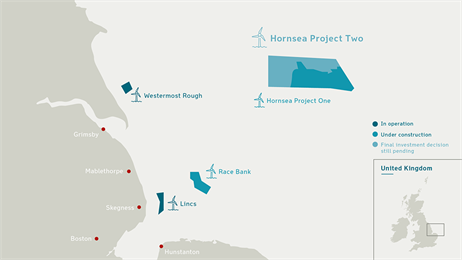 UK Business and Energy Secretary Greg Clark MP has this week approved DONG Energy’s Hornsea Two offshore wind farm, the largest of its kind in the world. The move is likely to reassure the renewable sector and green campaigners alike that the newly formed Department for Business, Energy and Industrial Strategy sees offshore wind as a key component of the wider industrial plan for the UK. The development will be made up of up to 300 turbines and have a total capacity of up to 1.8GW. DONG Energy say this will meet the electricity needs of approximately 1.6 million UK homes every year. Despite the planning consent, the scheme is not without controversy with serious concerns raised about the possible impact on seascape views, wildlife and ecology. In its recommendation to the Minister however, the Planning Inspectorate concluded that the adverse impacts were not of sufficient significance to override the increasing national need for renewable energy generation. Changes to energy policy earlier this year had threatened the future of the wind energy generation in England with critics suggesting David Cameron had moved his party well away from the ‘Vote Blue, Go Green’ vision that had so defined his 2010 General Election campaign. While this latest move sees Theresa May’s Government standing by the Party’s 2015 manifesto pledge to halt onshore wind development subsidy, it also recognises the potential of the offshore energy generation capacity we have in Britain. The project will be licensed by the Crown Estate which owns virtually the entire seabed out to the 12 nautical mile territorial limit. Crown Estate’s own data shows that the UK already generates more electricity from offshore wind than any other country. Currently the sector meets approximately 5% of annual demand in the UK but as Hornsea Project Two and other similar developments come on line, we can expect this to double in the next 5 years. 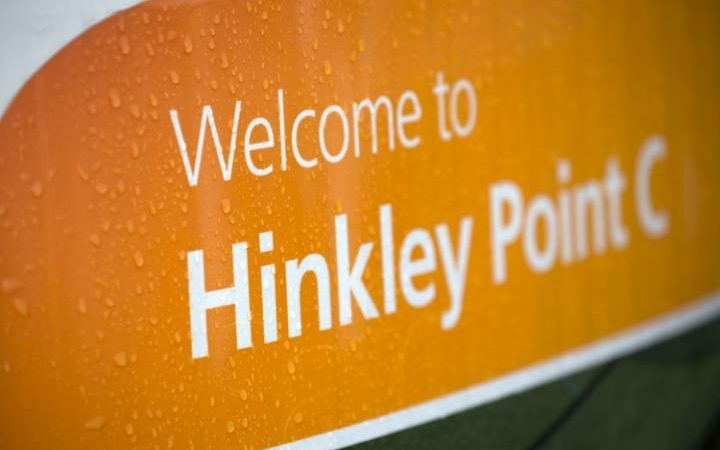 The planning consent, granted in the wake of the Prime Minister’s decision to delay the Hinkley Point nuclear project could be an important indicator of future policy change. The Crown Estate’s figures suggest that Hinkley will cover just 7% of the UK’s energy needs by 2020, falling well behind the projected output for offshore wind. 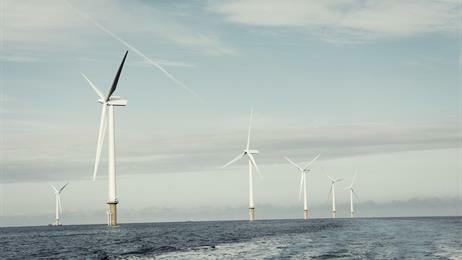 This capacity potential for offshore wind energy means it could be a major player in the UK’s wider energy mix. While it is still early days in terms of this Government setting out it’s key priorities, this could be the beginnings of a concerted push by Government to pursue a low carbon industrial strategy.